Today's nail art started out being a possible holiday nail art idea, but ended up being something totally different. 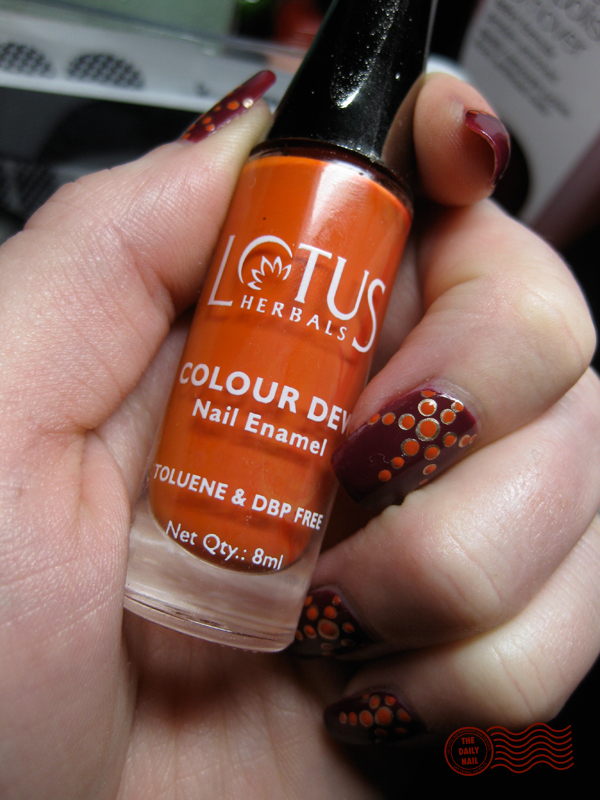 I liked it after I added the gold, but felt like it needed more, so I mentally scanned my nail polish collection to find a polish that would compliment both colors, and I came upon my Lotus Herbals Orange Alert, which was a gift from Chris when he came back from India, and happens to be one of my favorite polishes (and most rationed) in my entire collection. I can't get a proper picture of it, but it is the precise color of papaya flesh- that coral/orange/red combination, and I adore it. After adding the Orange Alert, it took on a look of coral and gold costume jewelry, not the original holiday look I was intending to make when I started! I actually like it better this way I think!! 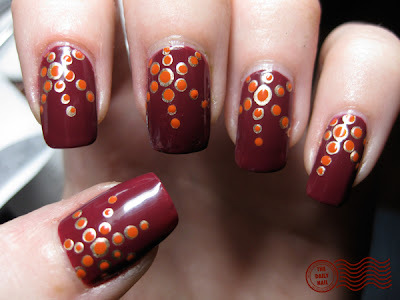 I used American Apparel Berry as a base, with China Glaze 2030 from Khrome Collection and Lotus Herbals Orange Alert for the dots. Topped it off with 2 coats of Seche Vite top coat. Anyone else getting excited for Thanksgiving?!!?!??! I'm sooooo hungry! I want to brine my turkey this year (I've never tried it before), anyone have any good brining recipes or tips? So pretty, gotta love those 'happy accidents' where things just come together. Oh, I like papaya! Pretty color! Hey I use Alton Brown's brining recipe! It is soooo awesome. If you just want to start simple with the brine, use 1 cup brown sugar, 1 cup kosher salt, a couple bay leaves, a sprinkling (15-20) black peppercorns and 6-8 allspice berries. Bring to a simmer in a large sauce pan with several cups of water and stir until all salt and sugar is dissolved. Pour into container your going to brine in and add several cups of ice to chill and dilute brine. Now I use a 30 qt stockpot for a 22 lb or so bird. Once I place the bird into the stockpot the brine nearly covers it using my measurements or I sometimes add a wee bit more water. If your bird is smaller (or you're using a small cooler or something) you will probably need to double the amounts for the brine. We do it in the pot so it will fit in the fridge but we've also done it in a cooler in which we packed ice over the bird, put the cooler in the garage and turned the turkey ever couple hours. Don't know if Vegas is cold enough for that. I think if you start with a more basic brine, you can experiment with altering or adding more complex flavors with each additional turkey until you get it the way you like it. I have discovered that although I love using citrus with roasted chicken, I don't care for it with turkey, at least not at Thanksgiving. And Costco had fresh turkeys for 89¢. Got one last year and it was delish. So pretty, I love that berry color u used as a base! I stick w/the basics, but there are a million recipes out there, it all depends on how much flavor u want to add into your turkey. My recipe changes every time I make it. Put sugar and salt in some water, and bring to a boil. It helps to dissolve the salt/sugar mixture so that it doesn’t sink to the bottom. In a large nonreactive container (glass/plastic etc) add salt/sugar mixture; add more water to cool to a safe temp. Add your spices and aromatics. For spices, I like the usual thyme, rosemary, sage, (parsley sage rosemary and thyme lol- if using fresh I like to hit them w/the back of the knife a few times to bruise them to release the flavor, dry spices are completely fine, it’s up to you) and some peppercorns. You can also add some red chili flakes, or cayenne if u want to add a little heat. It really is up to what u want, you can’t put too much in, you can stop at just salt sugar and water and still have an amazing turkey! Once all your goodies are in the mix, add the turkey, then add more water to cover, I always add ice too. Brine it up to 24 hours, not usually less than 8 in a nonreactive container, plastic/glass etc. and keep it cold! Oh..Sandi, you post didnt show up b4 mine lol, or I wouldnt have gone into my whole novel! I agree w/starting out w/a simple recipe! One thing I forgot to add, is when making your gravy, do not salt w/out tasting, ur drippings add a lot of salt from the brining. so adjust accordingly! And always rinse your turkey after you pull it out of the brine. :) I love this design. So cute and mod. I'm jealous of your indian nail polish!! I love this - I think it would be perfect for Thanksgiving! I might just have to borrow this idea. And okay, you all have convinced me- I, too will brine the bird this year! Thx for the info/recipes! I love your nails! They look exotic. That is a lovely design, and I think it works perfectly for Thanksgiving! Very warm, very rich, very festive!! I have several notebook pages of ideas to try for the holidays, I just need to get time to DO them!! I think I'm gonna work on false nails, just for the ability to work on more than one at once! Tried this today for my Christmas eve party but with gold and green dots! Came out pretty nice!!!! Also...what brushes do you use? I can find a find a nice thin one..
it is definitely our hornor to have a look at at the website,it is definitely great.